Hands gloved in blue, Suzett Fernandez, a junior majoring in Human Development and Family Sciences, picks plastic spoons and water bottles from a soupy brown muck made from melted chocolate ice cream and cake. Standing at a portable table, she puts recyclables in one bin and squeezes the rest into a compost bin. The third bin is surprisingly empty: it is for trash—just a few ice cream wrappers—that will head to the landfill. 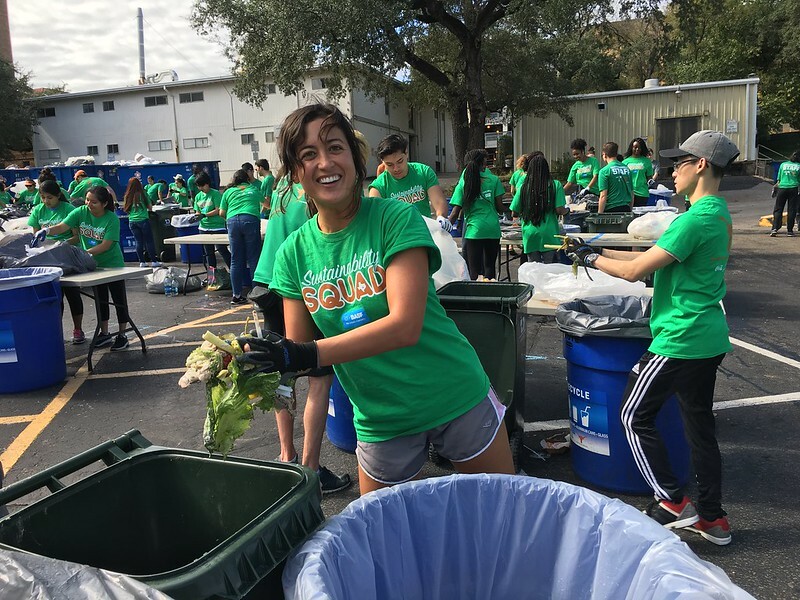 Fernandez is one of more than 300 students who have volunteered to spend Sunday morning sorting compostable and recyclable items from trash. It is November 4th, the day after UT Austin narrowly lost a football game to West Virginia, and 49.59 tons of trash in 14 dumpsters have been hauled from Darrell K Royal-Texas Memorial Stadium and placed in an empty parking lot behind an engineering building. Techno disco beats fill the air, while groups of students clad in kelly-green ‘Sustainability Sort Squad’ t-shirts huddle around tables and push carts full of plastic bags that reek of beer, soda, and chili. The Texas Athletics Sustainability team focuses on achieving zero waste, or making certain that at most only 10% of trash generated at a sporting event is disposed of in the landfill. The roots of the zero waste program began in 2010 as tailgate recycling in coordination with the Office of Sustainability. Tailgate recycling was so successful that it was easy to set sights on a much larger contribution to total trash: the more than 100,000 people who fill the stadium for each Texas home game. At first, Texas Athletics worked on educating fans about recycling. But by 2015, they began simplifying the kinds of material coming into the system by working with vendors. That was when black plastic nacho trays, for example, were jettisoned and replaced by compostable paper boats. In addition to narrowing the range of material coming into the stadium, Lichterman and her team also piloted the sorting of waste during sports events with smaller footprints than football games. The first zero waste event on campus was a softball game in 2014. By 2017, the Sustainability Sort Squad successfully diverted 90% of the material collected during the entire baseball season, and Texas Athletics was named Innovator of the Year by the Green Sports Alliance, a national organization that is a conduit for information about practices and solutions to environmental challenges. Students who spend their time putting beer caps or chili into the correct bins are raising money for organizations they are affiliated with. In 2018, over 50 different student organizations volunteered during football game sorts, including Beauties and the Beat, the Hindu Student Association, Naval ROTC, and the Hispanic Health Professional Organization. The latter is the group that Fernandez and her fellow-sorters are affiliated with, and they plan to use the money their organization received from participating in the sort to visit medical schools and host their own events. “It is extraordinary to see so many people come together to help Texas Athletics achieve its sustainable, zero waste goals,” says Chris Del Conte, Vice President and Athletics Director. The 2018 football sorts were very successful and almost achieved the target of zero waste. On that day in early November, UT Austin football had its largest diversion rate to date: 75%. Because of this and other work by the Sustainability Sort Squad, 94,746 pounds—almost 50 tons—of material was recycled, composted or donated, and UT Austin place third in the Game Day Recycling Challenge among 65 colleges and universities, moving up from 5th place the previous year.